Summer is on it's way. The ups and the downs of this season, the sun and the rain, the grass and the dandelions... The possibilities are endless. 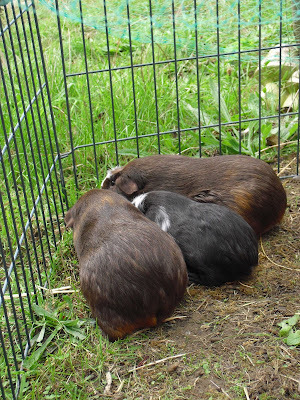 The pigs have started to become once again accustomed with the great outdoors and the endless roaming space. The ability to just lie in their pen in the sun or shade, to run around their theme-park and experience all that our garden has to offer them, it is so great to see them having a good ol' time. Best of friends, Best of bums! Can You Feel the Piggy Love?! Lily and Sgt Pepper sharing a kiss!! Popping outside early in the morning to grab some hay or Wagg for the piggies can only lead to one thing...The cry of the wild! They all line up against the cage doors and start wheeking and begging to go outside. You try getting through to them and telling them that it is far too cold, wet and muddy for them! They don't listen, they stay all lined up until you feed them. But momnets later one of them is back begging to be let out. You put them down for floor time, but one always has to make an attempt to get to the backdoor (namely Humbug). As some of you will know, in August, we added to our herd with little Humbug. Well, Humbug is now not so little. When we weighed her a few days ago, she was over lb!! So we must be doing something right then for her to have put on so much weight in under a month!! So I'll leave you with a very comfortable Humbug in her little cavy cosy!! Meet Humbug!! She's about 9 weeks old and is probably the quickest piggy adapter I've ever come across! We put her in her cage and she started eating immediately!! She is going to be living with Sgt Pepper, Bramble and Trudie. Bramble has been mothering her right from the start. Awwww! Here are Bramble's official summer portraits!! Let the sunny weather begin! New Member in The Family..
Meet Sgt Pepper. He is the first Boar we have ever owned, but that doesn't seem to matter at the moment because he is a real sweetie! We are going to be getting him castrated soon, so that he can control our 'split-up herd' and bring peace and order to the family. He's certainly very spoilt, what with 4 females, lucky boy!! He is an Agouti (like Bramble!) and an exceptionally strong little fella. He is around 9months old, and out of all the piggies we have ever owned, he has settled in the quickest. We are not sure whether this is just coincidence, or just because he is a boy?! Here is a picture of him settling into his new home and just loving his grassy tube! Bramble & Trudie having lots of fun! She is a Satin Crested guinea pig. Her crest gives her a lot of character, but for all we know, she is the only guinea pig who can have a fit on their side and still popcorn at the same time. She loves to hop and jump about (especially on the sofa!) She loves her snuggles and snoozing the day away! She may be the shyest, most timid of all our piggies, but she definitely has the loudest voice, when it comes to tea-time (she gets a sudden wash of confidence come all over her!!) We don't know for definite when she was born, but we think it was either the 21st/22nd October 2009. We think she is a Dutch X Absynnian breed of guinea pig, but either way, she is very pretty! She loves her cuddles and posing for the camera (as you can see from the picture), but doesn't love these things as much as we love her! She is a one year old Cream Absynnian, with a big personality and an ever bigger bundle of fur!! As we do not know when she was born, we all agreed to celebrate her birthday on New Years Day, so as to stop any future arguments!! She is the Alpha female in our pack, but due to her having a rather large fight with Bramble when they first met, for their safety, we decided to keep them split-up. She is the star of Life With Bramble, as she has such a varied personality, be it playful, tired or even looking for a fella (when she is in heat!) 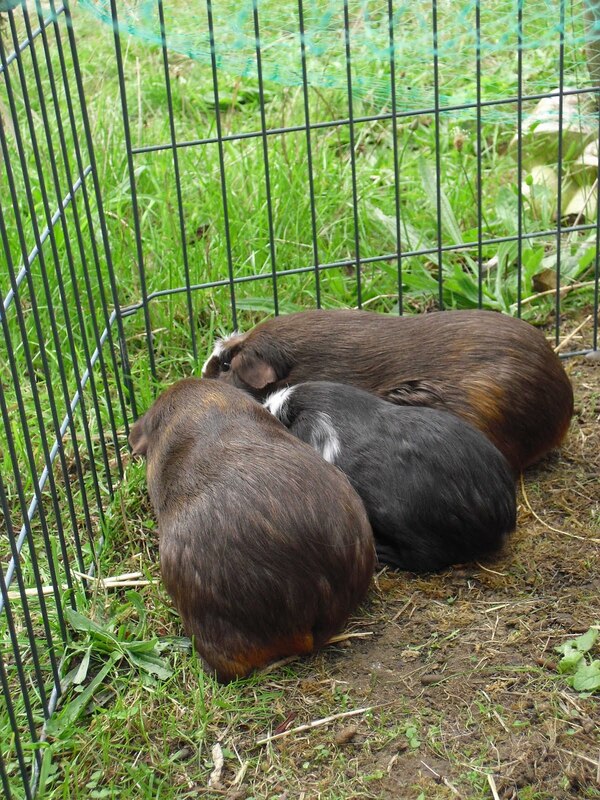 She was born October 10th 2009 and is a Chocolate Brown Satin Agouti with a big orange splodge on her bottom. She loves to eat as fast as possible, (especially with her spinach and carrots!) this usually results in her falling into a deep slumber a few minutes later. Despite this minor fault, she is an all round star. When playing on the sofa with Trudie, she loves to sneak in a little nibble with Krunch, (the stuffed toy) hoping nobody will notice. Welcome from Bramble and Mr. Rabbit! 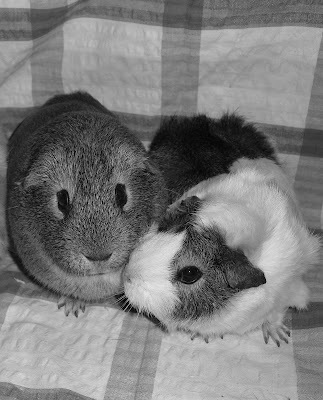 I have a passion for animals, and help take care of the 6 guinea pigs we own (Bramble, Trudie, Lily, Twinx, Humbug and Sgt Pepper). I love writing and reading and English has always been my strongest subject. I love foreign languages and am studying French and German.